The media landscape is forever changing and readers’ attention spans are shrinking. How do you keep your online visitors engaged long enough to read your blog post from beginning to end? Which attributes, do you think, contribute to a successful blog post? The answer is threefold. You don’t need to be an SEO strategist to give your blog post the necessary online boost it needs. Your writing process needn’t start and end with a Word document, in fact you’ll need to set aside some time to do keyword research. Google has the perfect tool for that, it’s called Google Adwords: Keyword Planner tool. No matter in which industry your business is, be it tourism, fashion or adventure sports – the keyword planner tool suggests the best keywords according to search volume, to include in your writing. However, you do need to create a Gmail account first and sign in. Additionally, you can use Google autocomplete to acquire topic ideas for your next article based on what people are searching for online. Alternatively, you can look at the bottom of the search results page at Google suggest. Using Google Keyword Planner to search for Cape Town-related keywords. You should choose keywords with high monthly searches with low competition. Don’t worry about bidding, that’s for paid media ads. Use Google autocomplete to find new topic ideas that people are searching for online. Google suggests related searches to your topic. These are good starting points for acquiring new topic ideas for your next blog post. Take the keywords you have researched and strategically place them where they’ll fit best in your copy. If you’re a good writer, this should be quite easy. For example, if you’re writing a blog post titled: “Top ten things to do in Cape Town,” your keywords should be focused around Cape Town tourism, activities in Cape Town, travel, bucket list Cape Town etc. These are all words that should naturally be included. One thing to keep in mind is not to overdo the keywords – this is known as “keyword stuffing.” Google will penalise you and your blog will be hard to find in search. A tip to remember – limit your keywords to two or three per 800 – 1000 word article. Give your post a boost by including header tags in the body of your copy. This includes H1, H2 and H3. H1 is your headline, H2 is for headings and H3 are your sub-headings. To improve your chances of search visibility even further, it’s advisable to include a meta description and focus keyword(s). This can be accomplished from the dashboard of your blog. 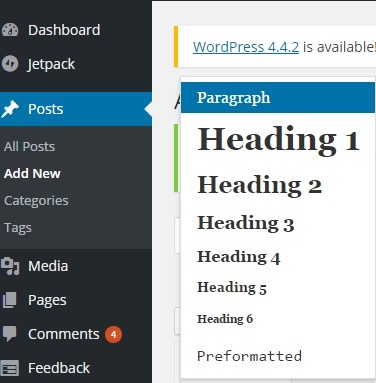 Different header tags to choose from in WordPress. Think of a title that captures your attention. What is it about the title that you like, or how can you write it differently? This is how you should think when you’re creating your blog post. Your goal is to entice an online user to click on your article. After that, it’s all about how well you write and how interesting your content is. Remember that content marketing is about adding value through storytelling, not pushing sales. People love pretty pictures, that’s undeniable. So, make sure to include related images no larger than 100kb. Using large images like those beautiful HDR photos on Flickr will cause your page to load slowly, resulting in the reader losing patience and closing your page without reading your blog post. When readers don’t stay long on a page, it is referred to as a high bounce rate. Many writers neglect to optimise their content images, which is a pity, since you will stand a greater chance of your images linking to your blog, showing up in Google Images. The first thing to do is to rename your images to something that describes the picture. Secondly, write a caption explaining the image (this is also where you place the image credit if it’s not your own). Thirdly, add alternative text to help search engines understand what the image is about, so that spiders can successfully crawl your site and boost your page rankings. A blog post without any images or without any alternative text will not receive good search results. Uploading and optimising images through the WordPress dashboard. Now that you’ve optimised your content and published your blog post, the final step is to share it across multiple social and social sharing platforms. A popular choice is Stumbleupon for plenty of views – if that’s what you’re after. Pinterest is also always a good idea if your post is image-rich. Tumblr is also a viable option as well as Google+. My favourite is Twitter because you’re able to utilise trending topics by using a hashtag in the tweet, which if shared, increases the post’s visibility and reach. If you feel that your blog needs some attention and care, contact experts in digital marketing, Liquorice Digital, while you do the things you’re best at.